Button Gwinnett was one of the three signers from the state of Georgia of the U.S. Declaration of Independence. 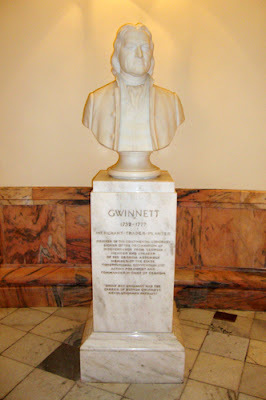 This bust (photo), located in the rotunda of the Georgia Capitol Building, commemmorates his contributions to the state. I recently learned that Button Gwinnett's signature is one of the rarest from Georgia. As a matter of fact, it's so rare that at Southeby's auction in New York last year on April 14, one of only 50 Gwinnett signatures, sold for more than $720,000. Gwinnett County, located immediately northeast of the Atlanta city limits, is also named for Button and is home to the Mall of Georgia (the largest shopping mall in the southeast), the Southeastern Railway Museum (Georgia's official transportation history musuem), BAPS Temple (the largest Hindu temple in the United States), and Gwinnett Arena (where Lady Gaga will perform on Monday, April 14, 2011). In additon to signing the Declaration of Independence, Gwinnett also served as Acting President and Commander in Chief of Georgia.